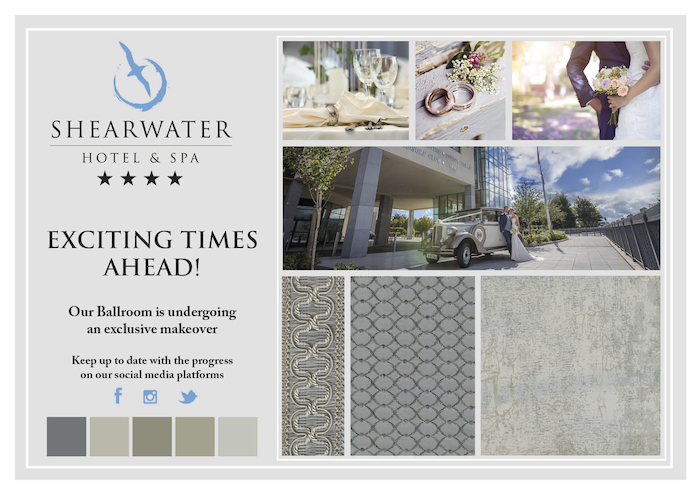 It is with great excitement that the four-star Shearwater Hotel & Spa announce that our Ballroom will undergo a full and complete makeover from January 2019. With the recent purchase of our property by Comer Group Ireland Hotels, it is a great time to get married in County Galway. Presently we are welcoming a very stylish makeover in our Lobby, Spa and Gym areas and graced with an interior designer who has an amazing eye. Great plans are firmly in place to present sophisticated elegant décor, boasting light grey panelled walls, natural touches of cream toned luxury, rich textured bespoke wallpaper, plush carpets, wooden floors, new doors, curtains, stunning candelabras draped in ivy, modern comfortable Chiavari cushioned chairs, floor length linen and much much more. Our private outdoor space will bring the outside in, by utilising our wall to wall windowed garden setting and really wow your guests with smart landscaping, outdoor lighting, heating, brand new seating, seasonal planting, all of which will look fantastic in your wedding photography. Our mission being that you will have ample choice for photos around the hotel. More time with your guests and one less concern regarding your scenic photography! We recently launched Shear-Beauty here in the Shearwater Hotel & Spa. This beautifully designed space is every bride's dream and offers the perfect backdrop for all your bridal prep. Our expert Spa team, offer complimentary skin consultations to all our bridal couples, we are proud to announce that we have recently launched image skin care to 'THE SPA' Enjoy an image gift on us for all our newly booked brides. 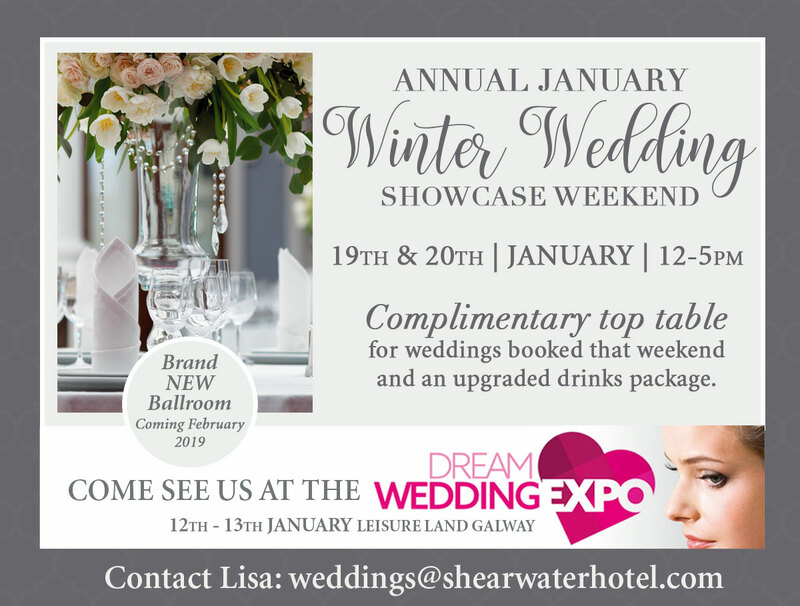 In order to help you visualise this exciting makeover, we invite you to our Annual Wedding Showcase weekend January 19th & 20th 2019, where 3 D Plans of the ballroom will be available to view, tables will be set up with new linen, chairs etc. Our team will be on hand to talk you through every detail and run through our new 2019 & 2020 packages. Shearwater Hotel & Spa’s unique selling points continue to be; our private ballrooms location & size, the number of separate individual spaces outside of the ballroom to entertain your guests before and after the wedding, last but not least, our five-star quality food, efficient and professional service. We are so excited to offer a complete and brand-new offering by presenting an exclusive superior & complete an individual package, one we can guarantee will set the tone for the day. Over the years couples have trusted us to deliver on every aspect of for their special day, this will never change! Whilst at present we offer a great product, we are content with the knowledge that couples booking their future weddings with our hotel will be gifted glamour and elegance to set us apart as one of the top hotels in Connaught. -Complimentary Car parking for up to 300 cars. -Complimentary personalised Sterling Silver cake knife. -Complimentary area within the beauty rooms for the morning of your weddings.